Fungal Meningitis: Could It Have Been Prevented? "Eddie epitomized the senior citizens of our modern society who are determined to remain active and who have much to give to their community." - Joyce Lovelace. Could the fungal meningitis outbreak have been prevented? It took the life of a dear friend of mine. And, not just me...Circuit Judge Eddie Lovelace was a dear friend of the entire community. Yet, now, his family, tragically, is left to deal his loss. The community lost, not only a great friend, but a great leader. Judge Lovelace died Sept. 17 at Vanderbilt University Medical Center in Nashville, Tennessee after receiving tainted steroid injections in July and August at Saint Thomas Outpatient Neurosurgery Center in Nashville. He was initially checked into Vanderbilt with symptoms that suggested he had suffered a mild stroke. Health officials later discovered he had contracted fungal meningitis after receiving epidural steroid injections produced by Framingham, Massachusetts-based New England Compounding Center, which had shipped thousands of vials of injections, many later found to be growing mold, all over the country. The Subcommittee on Oversight and Investigations heard testimony Wednesday about the deadly outbreak of fungal meningitis and whether it could have been prevented. The hearing began with stirring testimony from the judge's wife, Joyce Lovelace. Click on the video below. "The citizens of our community have lost a civic leader, a church leader, and outstanding judge. His near photographic memory, his booming voice, his sense of humor and his deep-seated concern for his fellow citizens led him to be a speaker at many civic and social functions and led him to frequently deliver eulogies of his friends who had preceded him death. His uncanny ability to quote Shakespeare, the Bible, poetry and famous quotations both entertained and brought comfort to many. (To the subcommittee) "Don’t just investigate. Instead, legislate and regulate. I challenge republicans and democrats alike to put aside partisan politics, partisan philosophies, industry lobbying and wishes of campaign contributions and unanimously send to the White House a bill that will prevent a recurrence of these events. If you will do that, perhaps my family can take some solace in the fact that Eddie Lovelace’s public service continues even after death." Eddie Lovelace was a public servant for some 50 years. He and Joyce were married nearly 56 years. Life will never be the same. The community will never be the same. The president of the NECC, Barry Cadden, was subpoenaed to appear before the committee but chose not to testify, invoking his 5th Amendment right instead. "I just sent one of my officers home. He was my S-2 (Intelligence Officer), Lt. Garlin M. Conner, who is from Aaron, Kentucky. I'm really proud of Lt. Conner. He probably will call you and, if he does, he may not sound like a soldier, will sound like any good old country boy, but, to my way of seeing, he's one of the outstanding soldiers of this war, if not THE outstanding." Lt. Col. Lloyd B. Ramsey, commander of the 3rd.bn.,3rd Div., 7th Inf., 7th Army. 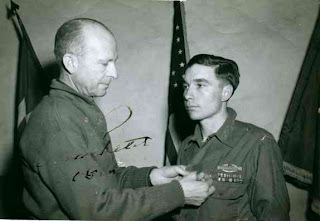 Conner's act of heroism happened near Hussein, France on January 24, 1945 at 0800 hours. Having just been wounded and laying in the hospital, Conner snuck away from it and ran back to his company at enemy lines. Just as he made it back to camp, he overheard talk that his commanding officer was needing to advance communication lines, and was looking for someone willing to run 400 yards directly into the enemy while unreeling a spool of telephone wire. Immediately, Conner grabbed the wire and off he went through the impact area of an intense concentration of enemy artillery fire to direct friendly artillery on a force of six Mark VI tanks and tank destroyers, followed by 600 fanatical German infantrymen, which was assaulting in full fury the spearhead position held by his battalion. Along the way, as he unreeled the spool of telephone wire, he disregarded shells which exploded 25 yards from him and set up an observation post. For three hours, Lt. Conner lay in a shallow ditch as wave after wave of German infantry surged toward him, at times to within five yards of his position. As the last all-out German assault swept forward, he ordered his artillery to concentrate on his own position, resolved to die if necessary to halt the enemy. Friendly shells exploded within five yards of him, blanketing his position but Lt. Conner continued to direct artillery fire on the assault elements swarming around him until the German attack was shattered and broken. Murl Conner was individually credited with stopping more than 150 Germans, destroying all the tanks and completely disintegrating the powerful enemy assault force and preventing heavy loss of life in his own outfit. Sadly, Conner was never awarded the Medal of Honor for his act of heroism. Due to the heat of the battle that day, the commanding officer did not take the time to do the necessary paperwork. Conner came back home to a hero's parade and then resumed his life on the farm and raised up his own family. He never spoke of what he did during the war to anyone, not even his family. But, what he did was earn the Distinguished Service Cross, Purple Heart with silver oak leaf cluster, Silver Star with four oak leaf clusters and the Bronze Star. He was also awarded the highest French medal, the Croix de Guerre. Many of his battle records were lost. The records that do exist officially document that Conner repeatedly risked his life under enemy fire to capture and disable numerous enemy positions with grim ferocity. What he didn’t mention was that he was wounded at least seven times during 29 months of nearly continuous combat service, but he refused to accept Purple Hearts for most of the wounds. One of his wounds was so severe that he was told he may never walk again, but he did walk. Also what he never spoke about was the many times that he risked his life to save others, and how that he more than once volunteered to take the point on the most dangerous patrols. Nothing of his heroic act on January 24, 1945 was ever mentioned until Richard Chilton, a former Green Beret from Genoa City, Wisconsin, discovered it while researching information about an uncle who served in the same unit as Conner. Because of Chilton, resolutions were introduced in both the 108th and 109th Congress, authorizing the President to award a Medal of Honor posthumously to Lt. Conner. However, it is yet to be done. The Army has recognized Murl Conner's heroism more than once. On October 3rd this year, Tank-Automotive and Armaments Commands Fleet Management Expansion Directorate dedicated one of its newest buildings in honor of him. One of two buildings, (buildings 5405 and 5415, which collectively make up the Maneuver Center of Excellence Combat Equipment Maintenance Complex), was named Conner Hall, in honor of the late Aaron, Kentucky native. Conner Hall will service hundreds of tanks and Bradley's in a given year. The other building was named in honor of Joseph Williams, who emigrated to America in 1924, and who played a significant role in World War II by helping develop the M4 series of tanks and later the T-series tanks. During the ceremony, Dave Carter, deputy director for the Integrated Logistics Support Center, which oversees FMX, said "We're here today to honor two very special people. We're honoring them because of their exceptional and extraordinary character and contributions to our Army and our country. Our hope is that in naming the Joe Williams Maintenance Facility and Conner Hall, we'll pay tribute to their dedication and inspire future generations of Soldiers and civilians … to do what Joe Williams and Lt. Conner did -- live beyond (yourself)." "It's a great honor," said his wife, Pauline Conner, of the building dedication. "He was … my hero. When he came back after his service, our county had a parade in his honor. I had never seen him before, but I had heard so much about him." Conner said her husband was a very moral man, and the legacy she hopes he leaves behind is one of patriotism and respect for his nation. Conner Hall maintains light tracked vehicles of about 36 tons and below, while the Joe Williams Maintenance Facility handles heavy tracked vehicles weighing up to 70 tons. Memorial plaques, bearing the names of Conner and Williams, are posted at the entrance to the facilities. Lt. Conner served in the same 3rd Infantry Division as Audie Murphy, who has always been recognized as America's most decorated hero of all wars, but the Medal of Honor would give Conner one more award than Murphy, who earned one less Silver Star for gallantry than Lt. Conner's four. I have written stories of Murl Conner's heroic acts more than once, and I will continue to do so, because awarding him the Medal of Honor is the right thing to do. As Chilton once said, "I do not have the option to give up as long as someone will listen."